Paidviewpoint.com is a paid online survey site. It is one of my favorites that I use every day. The best thing about this site is that you are pre-approved for all surveys they send to you. You will not complete half a survey just to hear you do not qualify. Paid Viewpoint will send you an email or text message every time a survey is available, and you will make money each time you complete a survey. 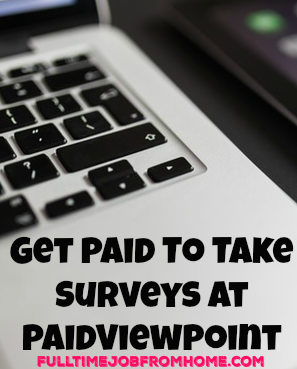 Even though PaidViewpoint is my favorite survey site it won’t be a huge income. You can’t expect to make a ton of money answering surveys online. If you’re looking for a large online income, check out My #1 Recommendation to learn how I made over $13,000 online last month! In this Paidviewpoint.com review, I’ll show you how taking surveys works, how to get paid, and the awesome things that I like about Paidviewpoint! How To Earn With Paid Viewpoint? There are two ways to make money on paidviewpoint.com. One is by taking surveys, and the other is my referring others. The main way to make money on paid viewpoint is by taking surveys. Every time you have a study available paid viewpoint will send you an email. Each survey is ten questions and usually pays around 10 cents each. You will receive around 5-6 surveys a week. Usually one a day. The awesome thing about paid viewpoint is the surveys are extremely short! Only ten questions most of the time. Also, you are always pre-qualified meaning you never get halfway through a survey just to be told you don’t qualify. The 2nd way you can make money through paid viewpoint is by referring others. You will earn 20% of what your referrals make every time they cash out! This is an excellent way to make money because you can earn by doing nothing! One advantage of having a lot of referrals is it will make you more money, but once you reach 100 referrals, you can start to collect what your referrals make on the fly instead of waiting for them to cash out. This is huge because a lot of your referrals will earn you money, but never reach the cashout amount. Once you receive 100 referrals you don’t have to worry about this anymore; you get their earnings right away! Paidviewpoint.com does have a ranking system which they call trait score. Your trait score is a ranking system out of 10,000 points. To be in the top 10% of all Paid Viewpoint Members you need a trait score over 9,000. I recently reached this mark and was rewarded a bonus, and I also make more for every question I answer. To make more with PaidViewpoint becoming a top member is a must. To do this take surveys that come to your inbox as quickly as possible and never miss a survey. Also, answer each question honestly Paid viewpoint will track your answers and if they are different every time you will never make it to a top member. The only method to get paid is through PayPal. 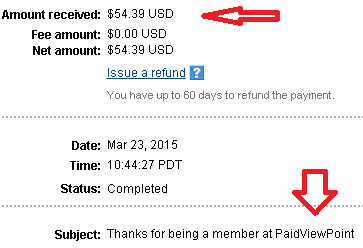 If you want to join paid viewpoint, make sure you create a PayPal account if you don’t have one already. The payment threshold or minimum payout amount is $15. Since you receive surveys almost every day it shouldn’t take long to reach the threshold amount. UPDATE: Now pays via Amazon & Walmart gift cards starting at $15. I gave Paid Viewpoint a 96 out of 100 because it’s one of my favorite paid survey sites. The surveys are extremely quick and offer you good money. The best part about Paid Viewpoint is you are only sent surveys that you are already approved for. No more wasting time trying to apply for surveys only to be turned down. I use paid viewpoint and recommended to anyone wanting to make money online. It is a quick and easy way to make a few extra bucks a month and can be turned into a large check with some referrals. Like I said before I use paid viewpoint, but as a user, I know there are some pros and cons. I enjoy the way you are notified when surveys are available, and the surveys are pretty short. Some things that I don’t like is the only payment option is PayPal which may pose a problem for some. Paid Viewpoint is perfect for people who are busy, but still want to make money online because you are notified when surveys are available, and you won’t waste your time completing surveys you won’t qualify for! Lately, I’ve been reaching the minimum cash out amount each month and have been making much more than $15 a month. I requested a payment via PayPal and the next day the payment was deposited in my account. 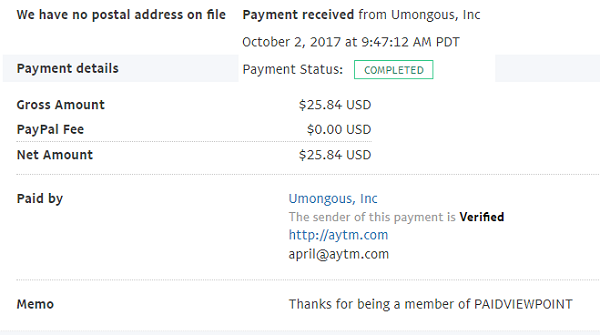 You can see proof of payment from Paid Viewpoint below! I highly recommend Paid Viewpoint to anyone who is looking to make extra money online. 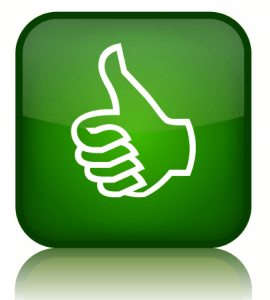 Paid Viewpoint is one of my favorites survey sites and is the best site for anyone with limited time on their hands. Paid Viewpoint automatically sends you emails when surveys are available, and each survey only takes a few minutes at most. If you think Paid Viewpoint is something you are interested in. You can join for free now! Click the picture below, and you will receive $1 for completing your account! If you would like to see other sites similar to Paid Viewpoint that can help you make more money online, check out my All Scam Free Jobs Post. If you would like to learn how I make money online with affiliate marketing, check out My #1 Recommendation to learn how I made over $13,000 online last month! Join Paid Viewpoint for FREE Now! Thank you for reading my PaidViewpoint.com Review. In this review, we looked at what is Paid Viewpoint. I highly recommend this survey site and would like to hear your input. If you have used this company in the past, let me know about it in the comments section below!